For true values we'll take the 2009 estimates listed in Wikipedia. For Canada, that number is 33.85 million; for Botswana, it's 1.95 million. 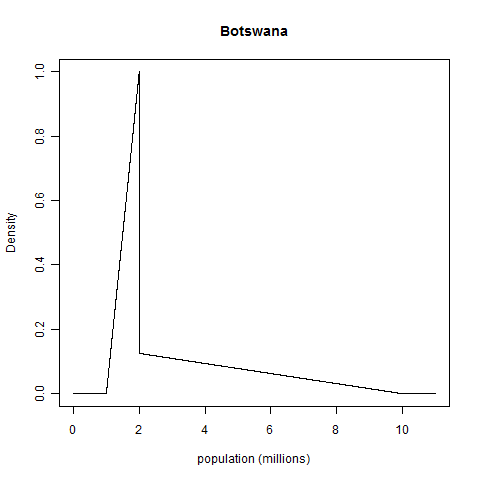 (The fact that my Botswana estimate was so spot on shocked me.) Given these "true values", how can we judge the calibration of the above distributions? The above densities seem so dissimilar that it's hard to conceive of a common basis on which they have some sort of equivalence. Fortunately, such a basis does exist: we take the total probability mass below the true value, as shown on the plots below. No matter what the shape of the probability density function, the random variable "probability mass below the realized value" always has a uniform distribution on the interval from zero to one, a fact known as the probability integral transform1. (ETA: This comment gives a demonstration with no integrals.) 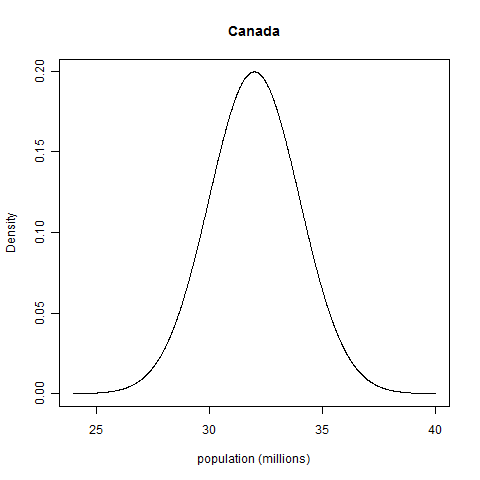 My Canada example has a probability integral transform value (henceforth PIT value) of 0.82, and my Botswana example has a PIT value of 0.45. The above histogram and the ones below show 10,000 realizations; the red line gives the exact density of which the histogram is a noisy version. I wouldn't expect humans to be under-confident, but algorithmically generated distributions might be, so for completeness's sake I'll show that too. In the case below, both the assessed distributions and the distribution of realized values are again normal distributions, but now the ostensible 50% intervals actually contain 95% of the realized values. We need not use coarse binning to check if a collection of distributions for continuous quantities is properly calibrated; instead, we can use the probability integral transform to set all the distributions on a common basis for comparison. 1 It can be demonstrated (for distributions that have densities, anyway) using integration by substitution and the derivative of the inverse of a function (listed in this table of derivatives).